Dewayne Sheppard is an fine artist in the DFW area. 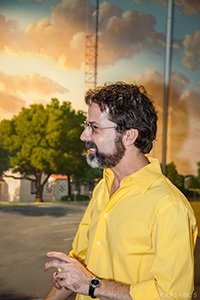 Born and raised in Fort Worth, as a child, he began copying architectural details Norman Rockwell paintings in pencil. As a teenager, he drew portraits of recording artists and sent them in as fan mail. Several years of oil painting lessons gave him a foundation in color theory. He works on canvas in oil and acrylic. He is also a mural artist, having done mural work all over the state of Texas. Clients who have purchased his work include the CEO of Exxon/Mobil, NBC Channel 5 Studio, Huntington/Highland Homes, and several other prominent business owners in the DFW area. His use of dramatic light and color are a trademark of his work.